Xenon High Intensity Discharge (HID) light bulbs are filled with xenon gas and use a stabilized arc of electricity to generate a whiter light source than is available from a standard halogen bulb. This type of lighting system uses a ballast to initiate and maintain the proper bulb voltage during operation. Xenon lamp technology is currently the most advanced development in the field of motor vehicle light systems. Vehicles equipped with xenon bulbs as Original Equipment improve visibility both at night and in poor weather conditions compared to halogen lamps. Xenon low-beam headlights provide brighter and wider road illumination and xenon high-beam lights provide longer range. 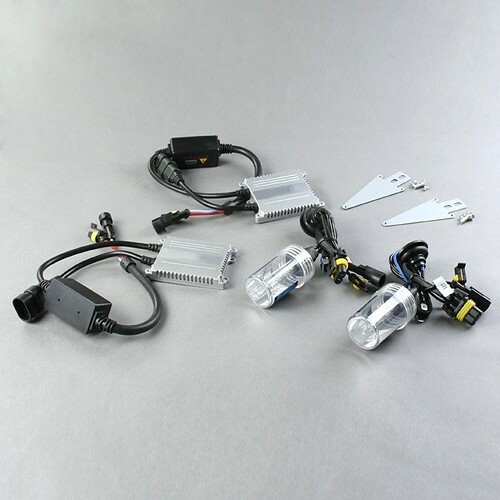 Fortunately, aftermarket Xenon HID driving light kits are available for those vehicles not equipped with Original Equipment xenon light systems. How does a Xenon light work? The micro bulb is full of noble gases including Xenon gas, unlike normal incandescent bulbs it doesn’t have a filament. Xenon lights up when an arc is created between 2 electrodes of xenon molecule. Also called High Intensity Discharge lamps, or HID. Xenon lights come with an electronic starter and a ballast maintain this arc resulting in the pure bright light. How does an HID ballast work? Plug and Play : HID Conversion Kit is "plug and play" for all halogen bulbs headlights.H1,H3,H4,H7,H11,9004,9005,9006 and 9007,H4 Hi/Lo, xenon-halogen . Save Power : HID light consume only 35W of electricity making them over 3 times more efficient than traditional halogen bulbs. Safety : HID light increased brightness of 300% (over traditional halogen bulbs) adds an extra margin of safety. Appearance : Attractive, cool bluish/white light is comfortable and very close to the natural light emitted by the sun. It makes everything easier to see at night. •	6 hours continuous working aging test. •	Connection circuit protection test. •	Short circuit protection test. •	Lack of voltage protection test. •	over voltage protection test. •	Flash light concussion test. •	cold, warm boot test. If any question, please contact me. My company specializes in auto lighting system (HID) and parking system. Maybe we can help you. ne1 familiar with MD technology?